IRDG’s Managing Director Denis Hayes was delighted to Chair the Inaugural Innovate Ireland Conference at the Aviva Stadium on the 24th February last. Organised by Research & Innovation magazine, the conference brought together over 500 stakeholders from the various bodies, research institutes and industries involved in Innovation in Ireland. There was ample networking space with exhibitors from all facets of industry and academia, and overall it was a very worthwhile event. 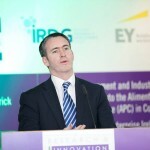 Damien English, Minister of State at the Departments of Education and Skills & the Department of Jobs, Enterprise and Innovation with Special Responsibility for Skills, Research and Innovation opened the Conference. The day comprised a series of very interesting and diverse presentations, featuring a combination of information sharing sessions on the various schemes and supports available to business, along with case studies and experiences from industry. Our thanks to the IRDG members who contributed and featured including Eirechrom, UCD, DCU, Bord na Móna, Glanbia, ESB, UCC, Mason Technology, Steripack Group & Dolmen.